How do I know if I need a stretch wrap machine? How many pallets per day (or per hour) do we typically wrap? If you wrap more than four loads per hour, or over 30 per day, then a stretch wrap machine would be a good investment. 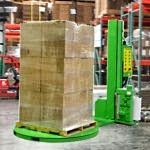 A stretch wrap machine can be cost-effective even if you wrap as few as 10-15 loads per day. The more loads you wrap per day, or per hour, the more sense it makes to invest in a stretch wrap machine. How much prestretch is required to effectively secure your load? The average person using hand wrap can attain a consistent prestretch of maybe ten percent. Stretch wrap can attain a prestretch of over 250 percent, depending upon the type of film and the machine being used. The higher the amount of prestretch, the more the film is stretched, the more tightly the load is secured, and the more loads you can wrap with one roll of film. How much time is being spent wrapping by hand? This is a subjective variable, but a stretch wrap machine can literally enable your worker to press a button and let the machine finish the job while they tend to other tasks. 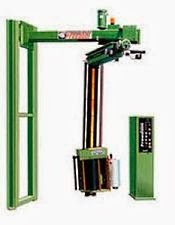 By eliminating the need to hand wrap, a stretch wrap machine can dramatically increase employee safety. There is no need to walk multiple times around a load, most of that time being spent bent at the waist holding a roll of stretch wrap. One stretch wrap machine can certainly be more cost effective than one worker's comp claim - both in terms of time and money. How much does a stretch wrap machine cost? Depending upon the size of the load, it can take one employee as much as three or more minutes to wrap one load. If they're wrapping 20 loads per day, for example, that's 60 minutes - or one hour - spent wrapping. 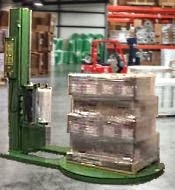 With a semi-automatic stretch wrap machine, that time can be spent doing other things rather than walking in circles around a pallet. As noted above, the cost of one stretch wrap machine can be significantly less than the monetary and time expense of one worker's comp claim filed due to back or other injuries sustained by using hand wrap. The chart below illustrates the potential savings of using a stretch wrap machine versus standard hand wrap. The comparison is made using true 80ga film. As you can see, for a machine that lists at $5995, you can pay off your investment in anywhere between 6 months and 4 years, depending upon your volume. With a higher grade machine, listing at $8995, it can be paid off in as soon as 8 months. And with either scenario, you're using far less film and therefore spending less money - you can wrap almost 70 pallets with one roll on a stretch wrap machine while only 9 with one roll of hand wrap (or 36 with a 4-roll case) due to the ability of the machine to achieve far greater and consistent stretch from the film. Another way of looking at it is that with one pallet of 80 ga 20" machine film (40 rolls) you can wrap approx 2750 loads (assuming 150% stretch). With one pallet of 80 ga 18" hand wrap (192 rolls, or 48 cases) you could wrap only 1690 loads. No matter how you look at it, using a stretch wrap machine will save you money and time in the long run. If the cost is still a problem for your budget, consider using the Section 179 tax deduction when you file your taxes. This can help cut your end cost by close to forty percent. How Do I Select a Stretch Wrap Machine?